I used to struggle finding the perfect gift for a friend. Until two months ago, an older and wiser friend of mine gave me a brilliant idea. A delicious, home-cooked, nutritious, whole foods meal (a lot of caveats there). Something I would love. Hint, hint to the husband. If he could cook. He is a man of so many gifts. But none in the culinary school. Ah well. So tonight, one of my friends is celebrating her anniversary, couldn't get out, and so we are bringing it in. A Spinach Salad with Chicken and Caramelized Onion Dressing. Sometimes I find the best recipes in the newspaper. Odd, but true. I found this one a couple years ago and it is a favorite. Slowly cooking the onions caramelizes them, and brings out the natural sugars. Pureeing allows the onions to emulsify and bind the ingredients together, reducing the amount of fat you need. *I substitute wild salmon or halibut for the chicken when cooking for myself. In shallow dish, combine flour, 1/2 t salt and pepper. Lightly coat breasts. Set aside. Heat oil over medium high heat. Add chicken and cook until well browned on both sides. Transfer to cutting board and slice into thin strips. Cover to keep warm. Do not clean skillet. Remove skin and pith from oranges. Cut into segments. Set aside. Return skillet to burner over medium-low heat. Add the onions and saute until softened and lightly browned. About 5 minutes. Add the ginger and cook for 1 minute longer. Stir in the oj concentrate and water and cook for 2 minutes or until slightly reduced. Pour onion mixture into a blender. Add vinegar and 1/2 t of salt. Arrange spinach in a large shallow bowl. Add the dressing and toss until the spinach is well coated. 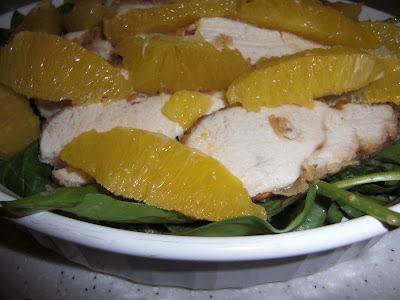 Arrange chicken and orange slices on top. Keep these recipes coming! I absolutely LOVED the other salad you made and brought to me, thank you! Even my husband liked it which is saying a lot because he usually is not a salad person. Where can you get the whole grain flour? I have a grinder and mill my own flour using a mixture of hard white wheat, spelt, and kamut. Obviously if you don't have a grinder you can't do that. You can buy good flour from the grocery store in the health food section. Bob's Redmill brand is usually a good bet. Glad you liked the salad.